The Junior Iditarod mushers have all crossed the finish line at mile 132 of the Denali Highway. The race was moved north from Willow to Cantwell after conditions were deemed to icy to run the tradition round trip route to Yentna Station. The trail conditions were primo, temperatures comfortable and scenery was splendid including northern lights. 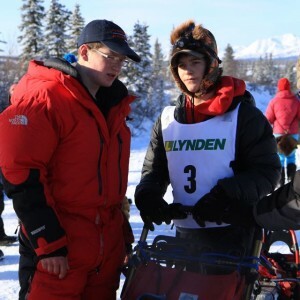 Kevin Harper crossed the finish line at 0946 on Monday morning to earn the Junior Iditarod Championship. Harper is a two-time veteran of the race. He placed third in 2014 behind his brother Ben Harper and Conway Seavey. While living in Washington, Kevin was all about soccer and wrestling. When they family moved to Alaska Kevin and Ben began to mush with Ray Redington, Jr. That was four years ago and now Kevin won’t be found on the soccer field or wrestling mat, his life has gone to the dogs. Harper is currently a junior at Wasilla High. After graduating, he plans to go to college and get his pilot’s license. In the mean time, he keeps busy with mushing, hunting, fishing and snow machining. Congrats Kevin, nice run. Harper’s average moving speed was 11.4 miles an hour over the 132-mile course. Jimmy Lanier crossed the finish line at 0948, two minutes behind Kevin Harper. Lanier is a three-time veteran of the Junior race with previous 4th and 6th place finishes. Jimmy’s average speed out and back on the Denali Hwy route was 10.9. While Lanier left the start line in the final position, he was second to make the turn around checkpoint at Alpine Creek Lodge. Jimmy is a junior at Chugiak High where he enjoys vocal music and baseball in general, pitching specifically. Lanier plans to attend college after graduation but hasn’t chosen a major as of yet. Kevin Harper made the halfway point at 1800, Jimmy at 18:10 and Dakota Schlosser as 18:12. Lanier was eligible to depart Alpine Creek Lodge at 0410 with an eight-minute lead over Kevin Harper. Lanier maintained the lead for most of the return trip but Harper kept gaining ground. Harper took over the lead a few miles out from the finish. Andrew Nolan has finished in 3rd place. Andrew made the finish line at 1021 with 10 dogs on the line. He left Alpine Creek Lodge at 0435 for the run back to the common start/finish line. His average race speed was 10.7 miles/hour. This is Andrew’s second Junior Iditarod. Nolan finished fifth in the 2014 race. He’s a homeschooled sophomore who plans to find a career in construction or commercial fishing when he graduates. When not mushing, Andrew likes to run, hunt, fish and trap. 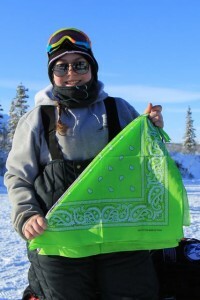 Jannelle Trowbridge has been the top finishing girl of the Junior Iditarod two years running. Crossing the finish line in 5th place this year and 6th place in 2014. Jannelle is from Nome. Her first mushing experience was with Greenlandic Huskies, a team her father bought from Jim Ryder after he did a solo unsupported run from Nenana to Nome along the trail of the Serum Run in 2011. Since then speedier Alaskan Huskies have joined their kennel. Trowbridge finished at 1155 with and overall average speed of 9.4 miles an hour. Janelle is a senior at the Nome Beltz High School and hope to attend the Coast Guard Academy. Her hobbies are running and cross country skiing. Marianna Mallory claimed 6th place coming to the finish line at 1206. For her rookie Junior race she averaged 9.4 miles an hour. Mallory formerly lived near Nome and became interested in the sport of mushing through watching Iditarod finish in Nome. Mallory now lives in Chugiak. The high school junior hasn’t decided what will follow graduation but she knows that mushing will continue to be a part of her life. Katie Deits formerly of California claimed the 7th finisher’s position. She crossed the finish line at 1210 traveling the 130-mile route with an average speed of 9.4 miles an hour. Katie now lives in Anchorage and attends Bartlett High School. She got into mushing because it looked like fun. Katie is running dogs that took Christine Roalofs to Nome in 2013 and will go again in 2015. As a sophomore, Katie enjoys Tae Kwon Do, biking and hiking. Rose Capistrant covered the 130-mile course in 15 hours 56 minutes. This is the first Junior Iditarod Rose has participated in. She arrived at the finish line at 1418 this afternoon with 10 dogs. Rose lives in Healy so with the move north, the race was practically in her own back yard. Many of the Capistrant dogs had blue eyes. I asked how many. Rose thought for a moment and said, “a lot.” Rose, a freshman, is home schooled and enjoys ballet, violin, voice, gardening and cooking. After winning the Red Lantern in 2014, Nicole Forto, claimed 9th place in this, her second Junior Iditarod. She averaged 7.8 miles per hour for the race. Forto is a senior at Houston High. Nicole says she could play softball and run dogs all day, everyday. Forto plans to attend UAS to study Marine Biology. Just before the race, Nicole was carefully folding green and purple bandanas into triangles. Her dogs looked pretty spiffy with the bandanas around their necks as they came to the start one. She had picked those colors to match her gangline. She’d decided to go with the extra color for the team on their final Junior Iditarod. 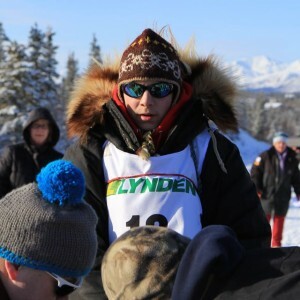 With a time of 8 hours 54 minutes, Jordan Seager was the final musher to reach the halfway point of the race. His return time was 9 hours and 9 minutes. In his rookie Junior Iditarod, Seager finished in 10th place with an average speed of 7.3 miles an hour. Hooray is 14 and has been mushing since last winter. He home schools and is in the 8th grade. When he graduates, he plants to pursue a career in the military. Winning the Red Lantern was Joan Klejka of Bethel. Currently Joan is a sophomore and plans to attend UAF when she graduates. Joan enjoys reading, running, cross-country, choir and art. Joan has been mushing since she was four. Joan finished with an average speed of 7.8 miles per hour. Four of her older siblings have participated in the Junior Iditarod. 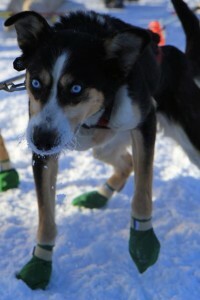 Piglet, the Klejka energizer dog, has been on the trail for many Junior Iditarod races and ran this race with Joan. Special awards were announced at the pizza banquet held in the Cantwell gymnasium this evening after the race. The Sportsmanship Award went to Andrew Nolan. Marianna Mallory received the Humanitarian Award. Jimmy Lanier’s leader Alpha received the Blue Harness Award. As the first rookie to cross the finish line, Dakota Schlosser was named Rookie of the Year.